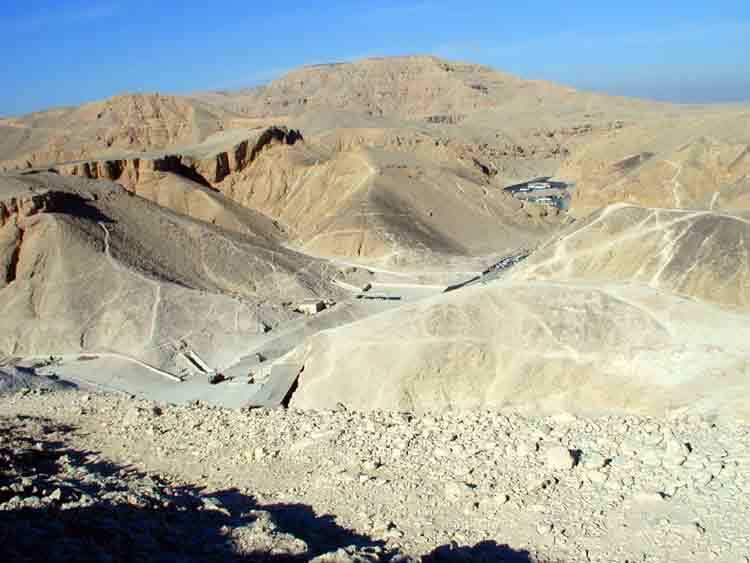 We decided to avoid organised tours and make our own way to Luxor, the site of ancient Thebes, the valley of the kings, etc. We were not the only ones; the local bus station was littered with Vasco da Gama rally-goers on Tuesday morning. The bus was late departing and quite tatty but we couldn't complain as the fare for the 5 hour journey was only about £2.50 each. 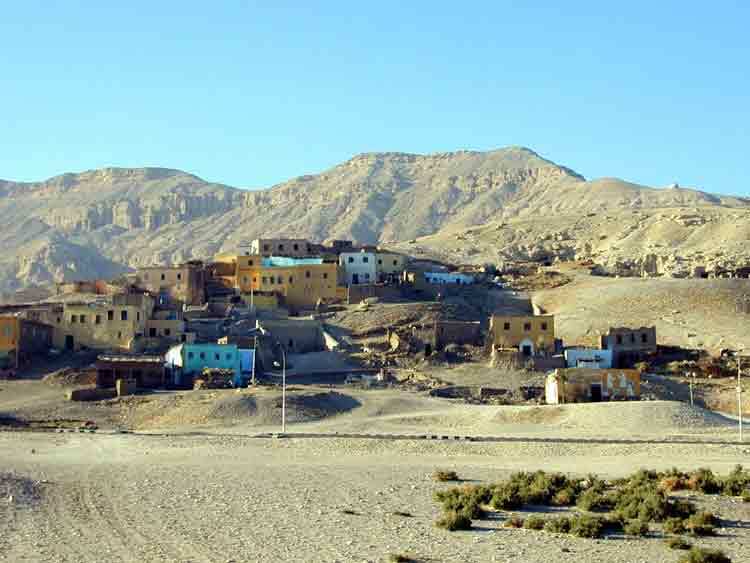 Four hours of desert, then into the picturesque Nile Valley in the late afternoon. 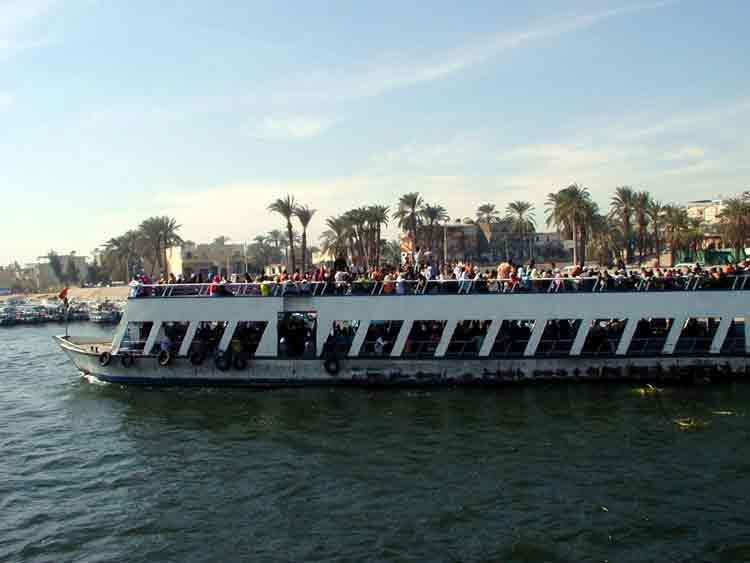 Our hotel was on the "other side" (the west bank of the Nile) and we were soon there by taxi and ferry. It was an excellent choice: well-run, good food, relaxed atmosphere and inexpensive. The manageress was really helpful, suggesting which sights to see and when. We could walk to most of the major sights on the west bank, and it was just a short ride (in the back of a pick-up truck at a cost of 2p each) to the ferry across to Luxor (another 9p!). 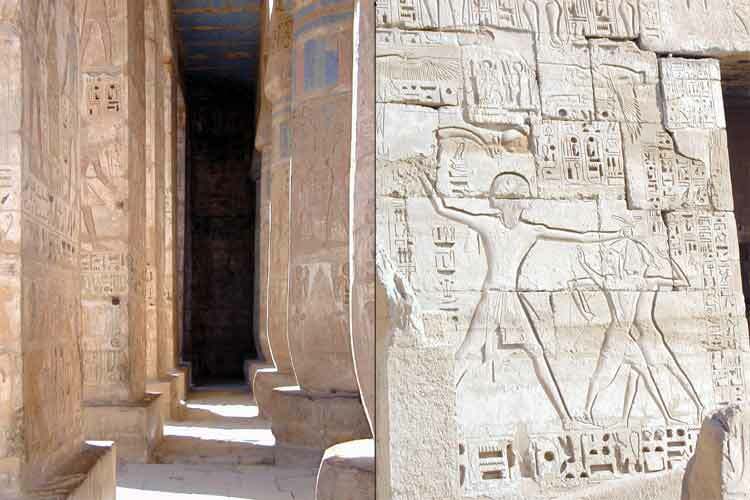 There is so much to see around Luxor that it's ridiculous to spend just 2 days there. In the morning we started with a local temple at Habu, built for Ramses III, and were amazed by its scale, detail and state of preservation. We could easily have spent a day there. As it was we had already squandered away half our morning, having been way-laid by a local who wanted to show us his village and take us for tea at his house. 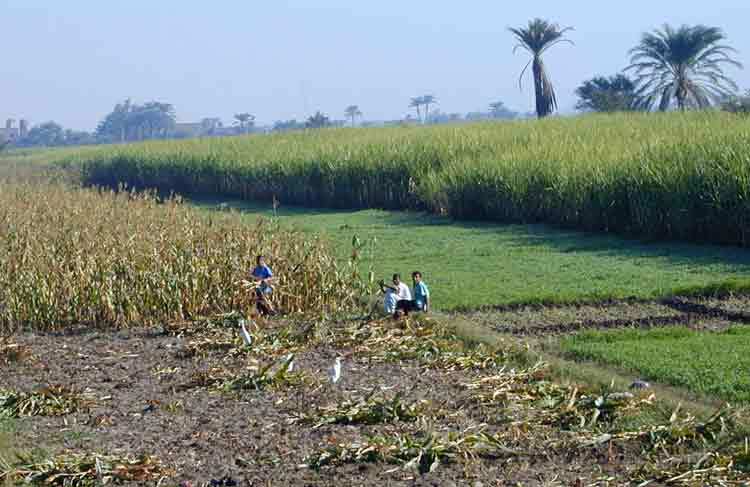 It was pleasant to walk through the fields of crops, mostly sugar cane, take photos of donkeys and banter (in our limited arabic) with the villagers (in exchange for the inevitable baksheesh). Fortified by an excellent (for Rachel but not Paul as the pizza had olives in it!) lunch at the hotel we spent the early afternoon in the Valley of the Kings. Why did they want to be buried there? Even at this cool time of year the environment is very hostile. Not for us the ghoulish experience of seeing Tutankhamen's mummified face and feet (the rest of the body is not fit for display). 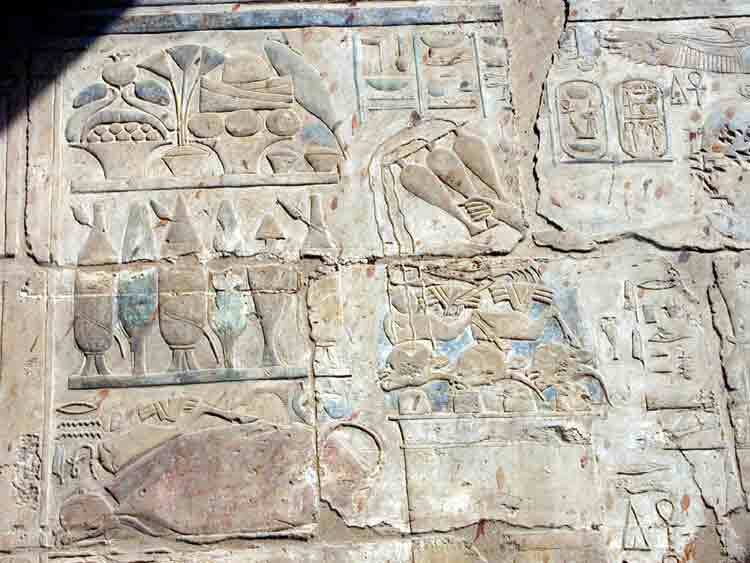 However, we were unprepared for the size and beauty of the other tombs. Most consist of long passages of ample height to walk through, with numerous chambers ahead of the burial chamber, some changing levels at various stages, and are beautifully decorated on the walls and ceilings. Some are just painted, others are carved and painted. Many look as if they were done yesterday with felt-tip pens, not 3000+ years ago with whatever materials they had then. Leaving the Valley of the Kings we headed up along a donkey track, passing signs saying "climbing the mountain is prohibited" to get a panoramic view of the west bank, looking back towards the Nile Valley. Walking back down towards the hotel we passed many temples and groups of tombs (for queens, nobles and artisans) that would have to be left for another visit. There is only so much we can absorb in a day and after a reviving cup of tea with mint in the hotel, we were off again for Luxor. Gurna village/tombs of the nobles - the site of political controversy over planning! We were too tired to do the temple so went to the museum which was wonderful. The Luxor museum has just a small collection of well-preserved statues and other items including one of Tutankhamen's chariots, very well displayed in very spacious rooms. We were exhausted from our day's exertions but really enjoyed our evening there. The next day we took the pick-up truck and local ferry again to go back to Luxor. 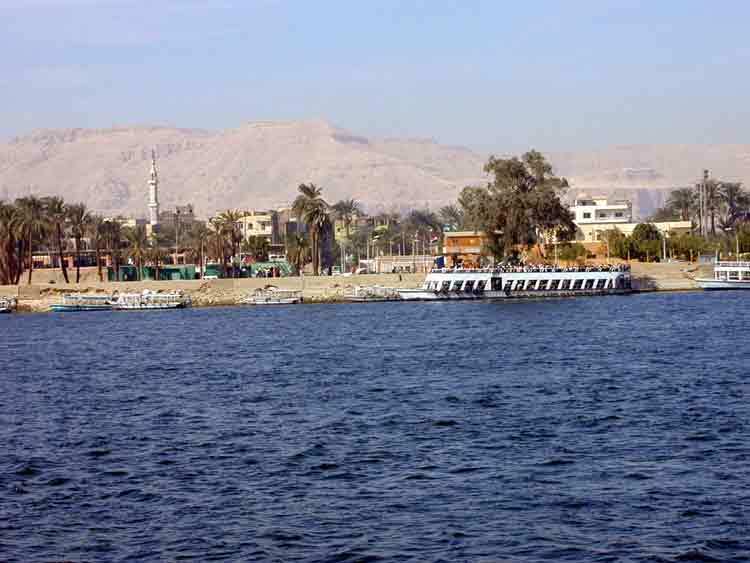 The Nile Valley is very attractive and the town of Luxor is much nicer than any of the coastal towns of Egypt we've visited. It was much less hassle than we'd expected. 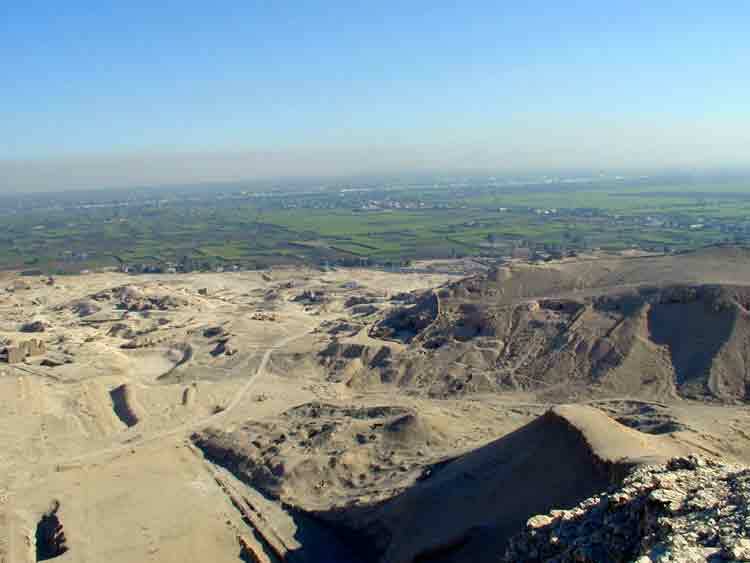 Perhaps we're getting the hang of being a tourist in Egypt? Touts trying to sell you something pop up in the most unexpected places and have to be firmly told "la, shukhran" (no thanks) or ignored. Reassuringly, there are armed tourist police everywhere. They are always very friendly and happy to give advice, for baksheesh of course. Their usual ploy is to ask to have their photo taken and then ask for baksheesh. 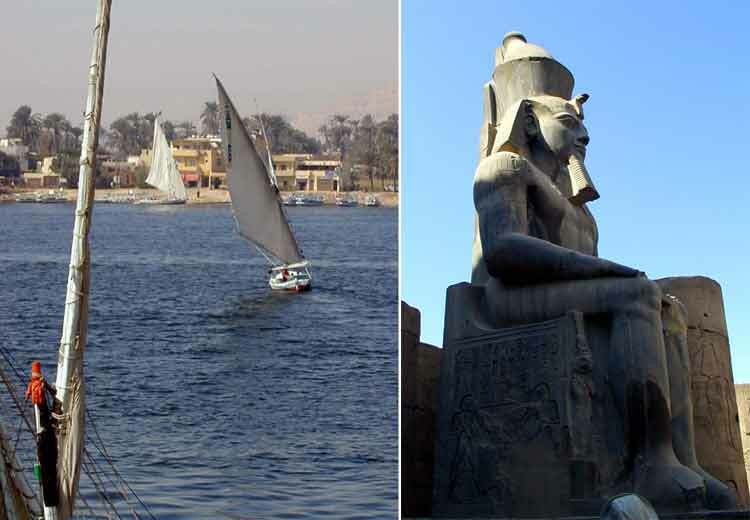 We resisted the temptation to sail a felucca - and went to see more statuary! We visited Luxor temple on our last morning. It's another facinating place and busy, being a high priority on most tour itineraries. Mornings are not a good time to visit major sights but we had little choice: we were due to catch the bus back to Hurghada in the afternoon. It's a spectacular place but being in the centre of a town and having a mosque sitting on top of part of it detracts from its splendour. On our way back we joined others from the rally (Guy, Michelle, Denise and Jean-Louis) who were catching the same bus. Everyone had had a wonderful time and wished they had stayed for longer. Now back in Hurghada we are planning our cruising for the next 2 weeks. Our next meeting point will be Port Ghalib, about 122 nautical miles south of here, where the rally will be based until the new year. In between Hurghada and Port Ghalib there will be few places to go ashore so we are busy stocking up with fresh produce. We are also making sure we have enough stocks of staples (wine, chocolate, smoked salmon, etc) to keep going until we get to Aden. The availability of shopping in Sudan and Eritrea is very limited so we can't rely on getting much there. Paul has just returned in triumph from a search for the Catholic church in Ed Daha (the old town) - not that we are converting; but opposite the church there is a Coptic shop which sells bacon! No one seems to be in a hurry to leave Hurghada. On Sunday we had quite a lot of cloud and after a few days of calm the wind was stronger yesterday. We will probably head off on Wednesday (5th).